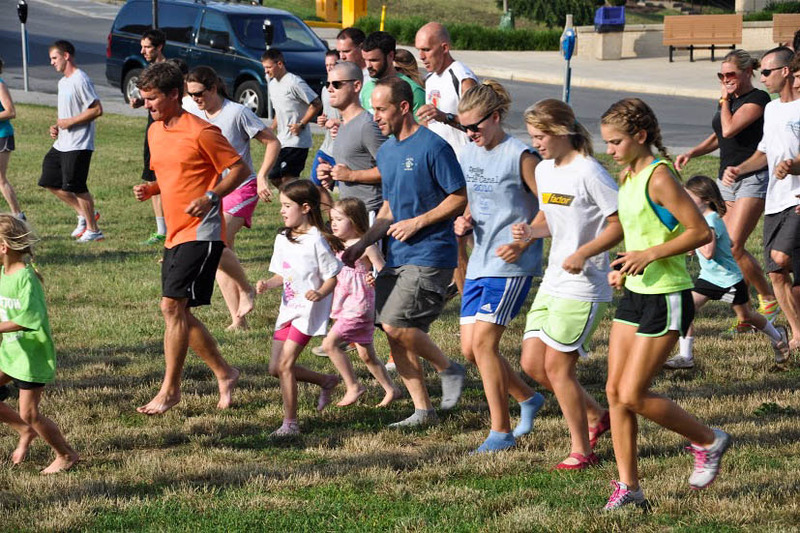 Shepherdstown runners take part in one of the frequent running clinics offered by Shepherdstown’s active running community. Ten weeks before the Charleston Distance Run, Charlestonians new to running took themselves from couch to 5K, thanks to a Running 101 beginner class offered by Highmark Blue Cross/Blue Shield insurance company. “They break it down into such small increments, you can almost quantitatively see improvement as you go,” participant Jason Elliott said. Several times a year in the Charleston area, the Genesis running program offers highly successful Couch to 5K courses. Hundreds of people in all shapes and sizes have completed the 5K. 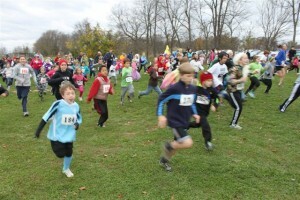 Read more about it at http://www.gofamz.com/running/articles/genesis-5k-training-program. Some running clubs and community groups offer beginner classes. Charleston students in Highmark’s beginner running class pound the pavement on Kanawha Boulevard. Photo courtesy The Charleston Daily Mail. 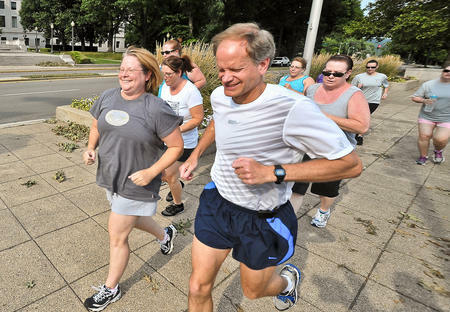 In Parkersburg, the River City Runners and Walkers Club offers beginner clinics and children’s classes, so people can ramp up for longer runs. They encourage beginners to join daily runs listed on their Web site. “We want to give people comfortable entry points and help them develop good running and walking habits,” said board member Sharon Marks. “We make a point of being a beginner-friendly club.” Their beginner classes have won national awards. 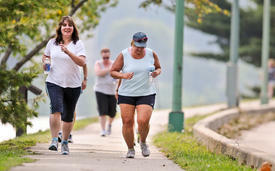 The Ohio Valley Runners and Walkers in Wheeling offer “Heart and Sole” beginners courses at least once a year. 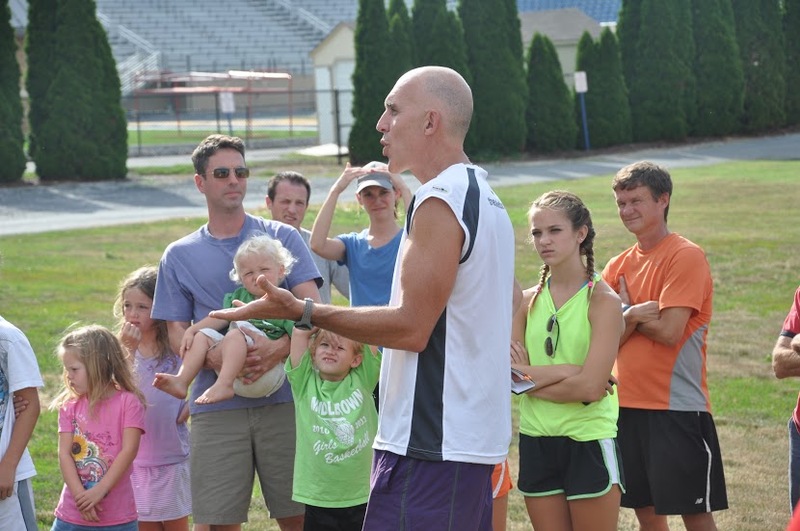 Chris McDougal, author of “Born to Run,” conducting a workshop in Shepherdstown for all ages on safe running habits. 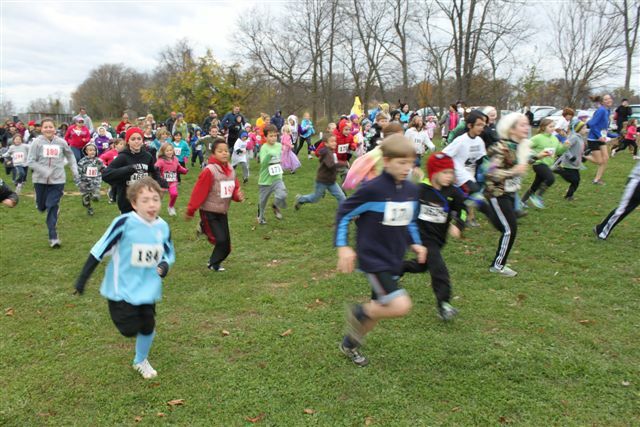 Get the experienced runners in your community together. Is there anybody who’d like to run a clinic? You can charge for it, or it can be free. If you have a running group and do not offer beginners’clinics, consider starting beginner clinics to attract new people to your group. Call Highmark for direct help. If one of their coaching employees live near you, they can put on a program for your community /or train you to do it yourself. Helpful material for beginner runners.